Feel free to bag me out, but I'm not really excited about Samsung's new curved screen Galaxy Round, which is basically a Note 3 (without the stylus) that got warped in the clothes dryer. Sure, it's got high-end specs and will stand up very well against the competition, but the big selling point is the curved screen, which is so minorly curved it may as well not be. If I'm excited about anything it's that I could now have a Note-sized phablet that would fit better in my pocket. Admittedly I've only seen photos and videos of the new device, so I am not one to judge authoritatively, but it seems like the first curved screen smartphone would be a little more, well, curved. The back of the smartphone is more curved than the front. But, being a fan of curved rears like the Moto X, I expect it will feel fantastic in the hand, and it does have some characteristically Samsung features. And I believe Samsung when they say the curvature will enhance one-handed operation. Samsung has introduced various roll gestures detailed below which means, for example, when you tilt the phone on a flat surface you will briefly see the time, missed calls, text messages etc displayed when the screen is off. Handy for checking the time when you wake up, but not exactly earth-shattering. There's also new tilt gestures and tap interactions for various built-in bloatware for music and photos. As a result of its unique curved design, users can take advantage of round integration experiences like the Roll Effect that enables user to check information such as date, time, missed call and battery easily when home screen is off, and the Gravity Effect for creating visual interaction with the screen by tilting the device. For music, the Bounce UX enables users to control their music. When the GALAXY ROUND's display is off while the music player is running, a short press to the left of the device will play the previous track while a short press to the right will play the next track. For pictures and videos, the Side Mirror feature enables users to gain access to list of the album content with a left and right tilt. 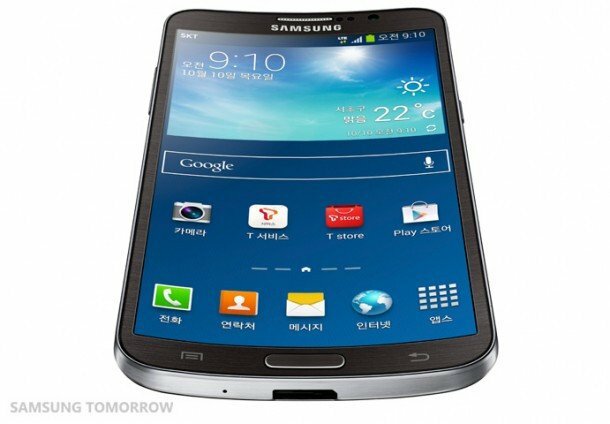 - Samsung Press Release for the Galaxy Round. 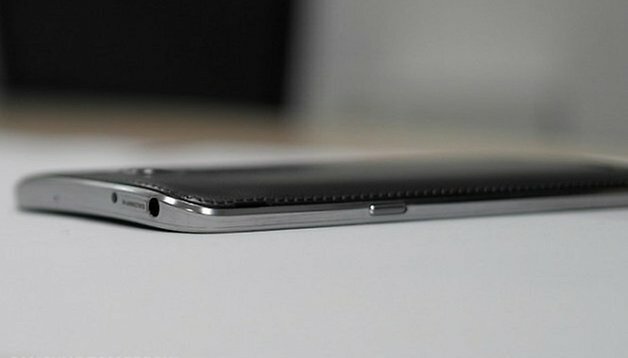 So while I'm not terrifically blown away by the actual curvature of the screen, the device is a true powerhouse and is an innovation, demonstrating that Samsung are so at the top of their game right now that they can beat anyone else to market and are willing to push products that no one else is. All the cries of Samsung not being innovative be damned, this device seems to be saying. So I salute Samsung's ambition if not exactly the result, including the same tacky faux-leather backing as the Note 3, but as I mentioned, I am yet to use the device. It may just blow my socks off. And at the very least, it'll fit better in my pocket and in my hand, and there's nothing wrong with that. There is no release information for the Galaxy Round outside Korea as yet, and LG will be revealing their new flexible screened phone this month as well. Keep an eye out, the curved revolution is coming. What are your thoughts on the Galaxy Round? Innovative or gimmicky? Would you prefer a curved screen phone and why? I just bought a Galaxy Round in Korea. I liked the feel, there is very little glare, and moving my thumb across the screen while one-handed is an extremely natural feeling. I often forget it's in my pocket as it's so comfortable. There is no "carrying a little board in my pocket" feeling. A commenter mentioned that is is a little slower on "roll". (whatever that is) It does seem to react to input just a smidgen slower than my son's Note 3, but other than that, it is a note without the stylus. I was looking at LGs G3 and S5, and did compare them in my hand and outside. The LG's screen is significantly smaller because of the screen-based keys at the bottom and the HUGE notification bar at the top! I'm really glad I spent a lot of time with the phones on. Would I recommend the Galaxy Round? Absolutely. Good call @Trent Neuman, then instead of paying an extra $300, you save $300! $300 more for a curved note 3 with no s-pen? No Thank you. Love Samsung but I'm going nexus 5. Faux simply means fake and it comes from French. I have mixed feelings about the Galaxy Round. It has top rate hardware that can beat out all competitors, however in the video, the Roll Effect was extremely slow. The guy had to hold the device down for a couple seconds before anything appeared on the display. I guess I will have to wait to try it out in order to see if the curved screen really improves usability.